When Is A Hit A Hit? With data about how audiences consume music across various plans providing a vast array of new tools for making new music decisions, radio programmers are seeking guidance on how to use these tools in concert with their new music research. 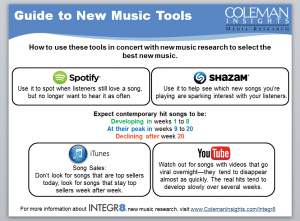 Coleman Insights new music research manager Matt Bailey provided that guidance through a series of blogs containing analysis and recommendations on how to use data from sources such as Spotify, Shazam, iTunes and YouTube, which was followed by a webinar on March 19th, 2015 in which he presented his analyses in greater depth. Below are free resources that should help you determine “When Is A Hit A Hit?” You can view a recording of the webinar, download a guide to new music tools for handy reference in the future and read each entry in Matt’s blog series using the links provided. Blog 1: When Is A Hit A Hit?